The new Strongholdz media page has all of the old posts as well as updated pages for the Zines and Videos. If you have linked to this page please switch your link to the new strongholdz page, thank you. 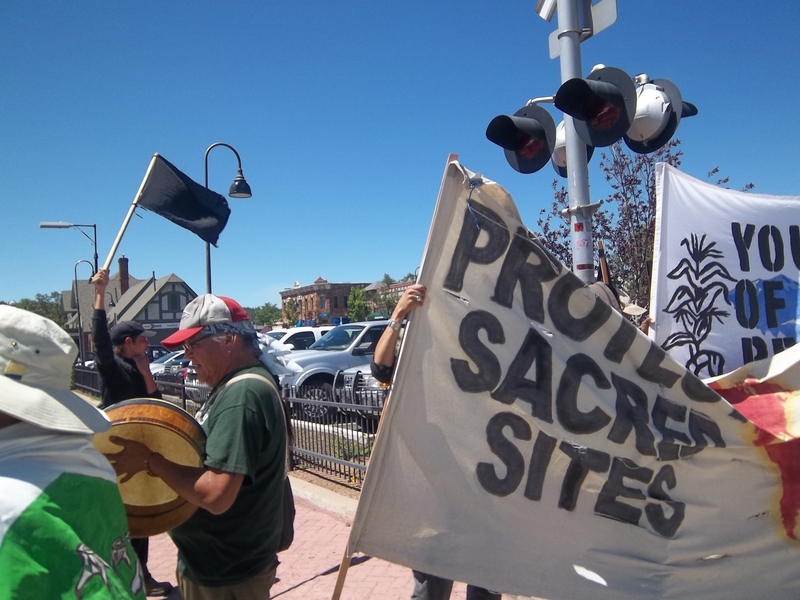 Chuckson (Tucson), AZ – The six protesters who locked-down and occupied the United States Border Patrol (BP) – Tucson Headquarters on May 21, 2010 were found not guilty on the remaining count of a disorderly conduct “with serious disruptive behavior” charge. Since the creation of the current U.S./Mexico border, 45 O’odham villages on or near the border have been completely depopulated. According to the migrant support group No More Deaths, from October 2009 to Sept. 2010 there have been more than 250 deaths on the Arizona border alone. Put this message in action and help end the attack on Indigenous and migrant communities. Take these messages to the street where you are. 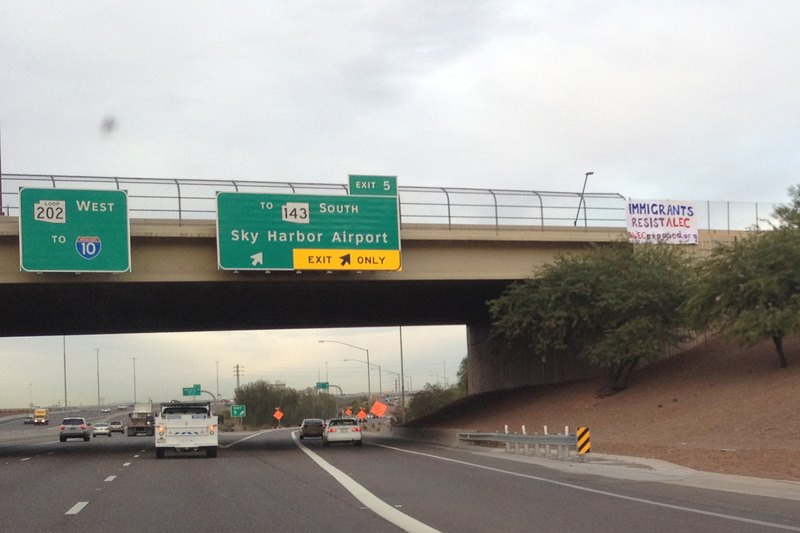 Early this morning ALEC resistors suspended banners at two different locations. My name is Serena Padilla. I live in Occupied Onk Akimel Jeved, now known as the Salt River Pima Maricopa Indian Community. 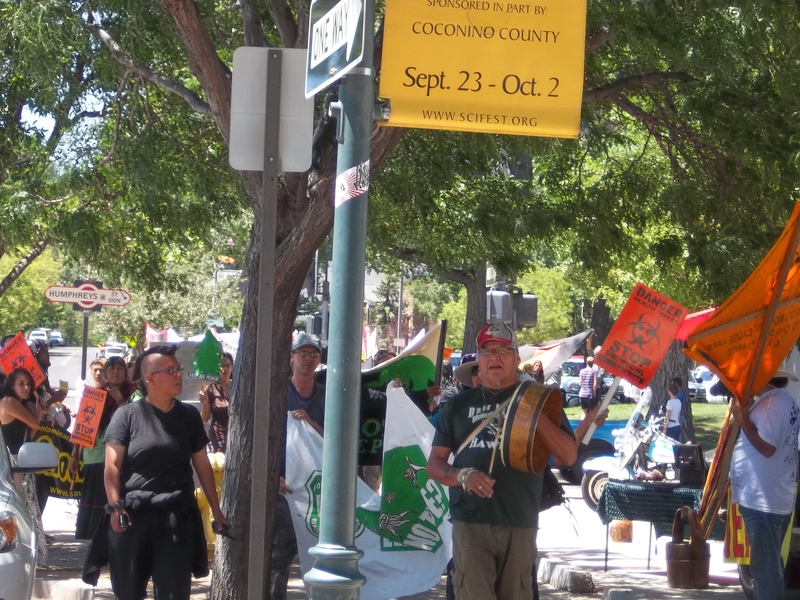 I am in support of an Indigenous convergence before and during the American Legislative Exchange Council (ALEC) conference, scheduled for November 30-December 2, in hopes to share, connect and build solidarity amongst all the Indigenous Nations that are affected by ALEC. At this time, I am opening my grounds to accommodate all Indigenous participants coming to our territory due to the ALEC Conference. I am opening my grounds for camping and access to my outside kitchen. I hope this gathering will strengthen our connections as Indigenous Peoples, now and for the future generations to come. 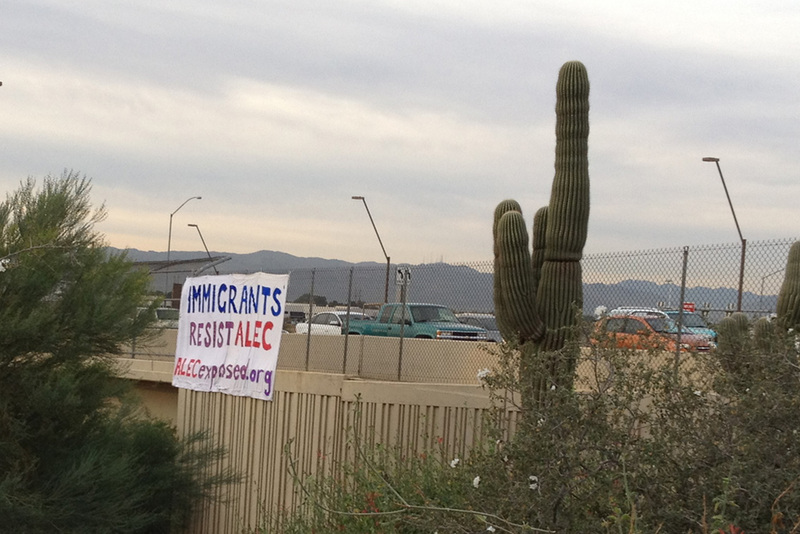 AZ Resists ALEC! Activist and scholar Ward Churchill, writer and speaker John Zerzan, and Professor of Religious Studies/Classics at the University of Arizona Dr. Julian Kunnie will speak at the Dry River Radical Resource Center on December 10, 2011 at 7:00 p.m. to benefit O’odham VOICE Against the WALL, which since 2003 has organized and advocated for the traditional O’odham leaders and O’odham communities, and the Dry River Collective, a center for anarchist organizing in Tucson for almost seven years. 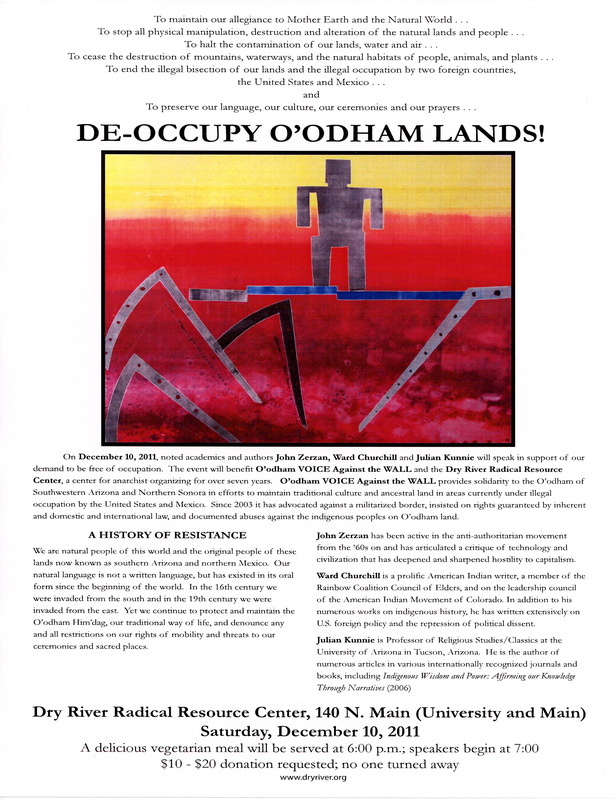 The event, “De-Occupy O’odham Lands!”, is a reminder that O’odham remain on only a third of their original lands and remain in resistance to the illegal occupation of O’odham lands by the United States and Mexico. Ward Churchill is a prolific American Indian writer, a member of the Rainbow Coalition Council of Elders, and on the leadership council of the American Indian Movement of Colorado. In addition to his numerous works on indigenous history, he has written extensively on U.S. foreign policy and the repression of political dissent. Five of his more than 20 books have received human rights writing awards. Former Chair of the Ethnic Studies Department, until July 2007 Ward Churchill was a tenured full Professor of American Indian Studies at the University of Colorado/Boulder, where he received numerous awards for his teaching and service. In April 2009 a jury unanimously found that he had been fired by CU in retaliation for his observations on 9/11 and in violation of the First Amendment. Professor Churchill is currently litigating to have that verdict upheld. John Zerzan has been active in the anti-authoritarian movement from the ‘60s on and has articulated a critique of technology and civilization that has deepened and sharpened hostility to capitalism. In recent years he has been published in the theory journal TELOS, the Detroit publication Fifth Estate, Eugene’s Green Anarchy, and Species Traitor (an anarcho-primitivist journal). His books include Elements of Refusal (1988, 1998), Future Primitive (1994), Against Civilization (1999), Running on Emptiness (2002), Twilight of the Machines (2008), and Origins: A John Zerzan Reader (2010). Future Primitive Revisited will appear in Spring 2012. His weekly Anarchy Radio broadcast streams live on KWVA radio, Eugene. Oregon, USA; past shows are available at www.johnzerzan.net. Julian Kunnie is a Professor of Religious Studies/Classics at the University of Arizona He is the author of numerous articles in various internationally recognized journals and books. His books include Indigenous Wisdom and Power: Affirming our Knowledge Through Narratives (2006), Is Apartheid Really Dead? Pan Africanist Working Class Cultural Critical Perspectives (2000), and Models of Black Theology; Issues of Class, Culture, and Gender (1994). His forthcoming book is Globalization and Its Victims: Wars Against the Earth and the Impoverished of the World (Rowman & Littefield). He is currently working on a prison research project that interrogates issues of race, class, and gender and is geared toward preventing the incarceration of youth, particularly those of color, entitled Enchained Humanity: A Comparative Study of the Infliction of Incarceration on Persons in United States and South African Prisons. The event will be held at Dry River, 740 N. Main (University and Main). It is open to the public. A delicious vegetarian meal will be served at 6:00 p.m. and speakers will begin at 7:00. Donations of $10 to $20 are requested, but no one will be turned away. The Dry River Radical Resource Center is a community space offered by anarchists for live music, free services from clothing to computer access, and fundraising for a wide array of popular causes. Since 2005 it has hosted musicians, filmmakers, writers and political organizers from all over the world. Run by volunteers, it is sustained entirely by donations. This is a zine from the Guelph Anarchist distro Mounting Bedlam Distro. 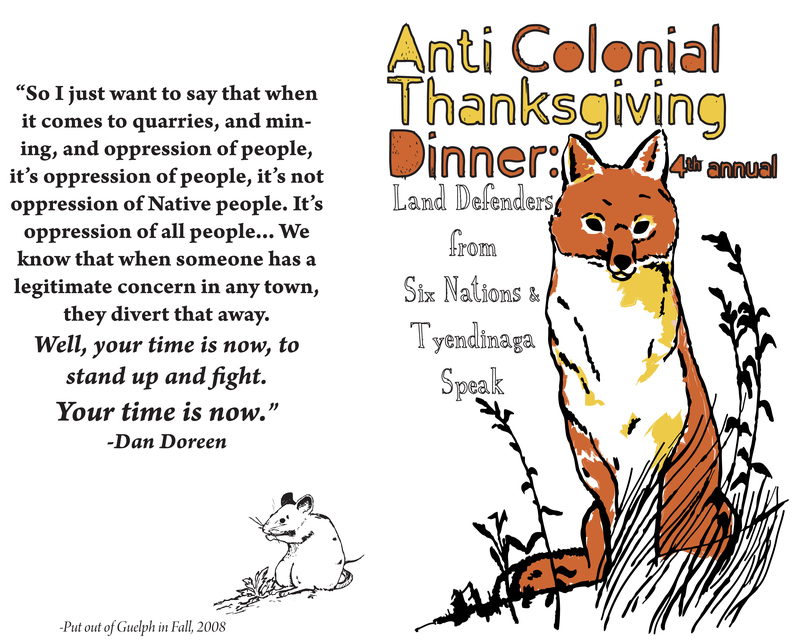 It is from an annual dinner that where Anarchists host Indigenous folks to share their stories of resistance. It has spoken to me for along time sine i found a copy of it at the Taala Hooghan Infoshop. If you get a chance download the PDF and give it a read. 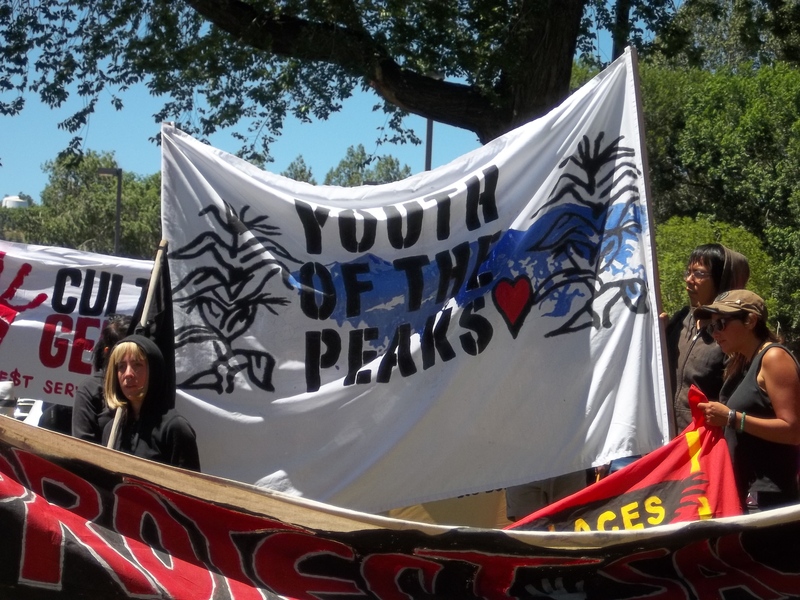 The ACT dinner is a yearly event that brings speakers from Indigenous communities including Six Nations and Tyendinaga, to discuss anti-colonial struggle. Dan Doreen from Tyendinaga, Boots and Skyler from Six Nations, Jackie from the Missasaugas of New Credit, and Sarah Dover an anti-colonial lawyer. Be it finally Resolved, that the Traditional O’odham Leaders also charge the Mexican Government, both Federal and State, to honor its responsibility to facilitate open communication with the O’odham representatives in the State of Sonora, Mexico, and to support decisions in the best interest of the O’odham, the Original people of the Land. held in Sonoyta, Sonora, Mexico. 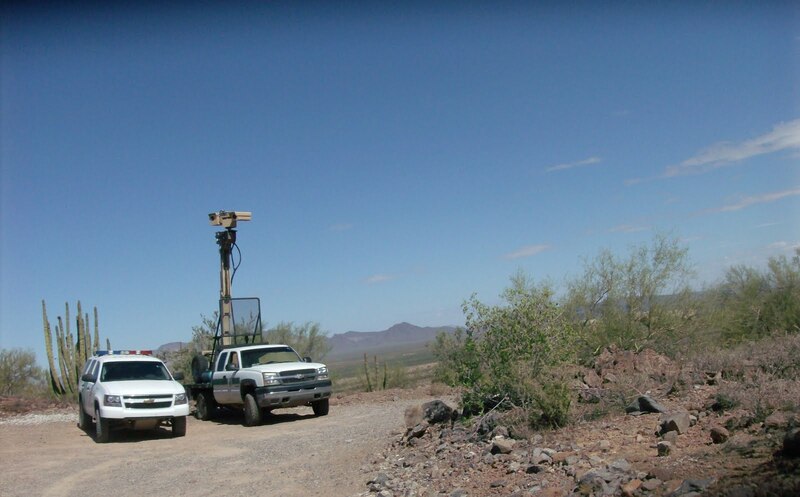 Hilton Head, SC – Silver Scott Mines, Inc. (OTC: SILS.pk) is pleased to announce it has increased its mineral concession holdings in the Quitovac Mine area in northern Sonora state. The Company had previously announced the acquisition of the Quitivac Mine concessions (Feb.10, 2011). The Quitovac mine area previously acquired consists of 13 older concessions totaling about 2500 hectares covering more than a 3 km. long zone of shear related gold mineralization. Previous property operators have calculated shallow drill hole based historic resources ranging from a low of 112,000 ounces gold in a resource averaging 3.14 grams Au per tonne (Technical Report, 2002) ranging up to 325,560 oz. Au in a resource averaging 1.35 grams per tonne. The new 12,000 hectare concession acquired by the Company covers a large area south and west of the older concessions but on trend of the gold mineralization from the mine area. Much of the new concession area is pediment gravel covered. The previously mined La Choya gold mine operated by Hecla Mining Co. is located about 8 km southeast of the Quitovac mine and 2 kms east of the new concession. Paved highway, electric power, and water are available within 3 km of the project site. Please help support the struggle to defeat this mine. If you are in tucson please show your support and attend the December fundraiser for O’odham VOICE Against the WALL. Here is a link to the Event. Resist ALEC this November in Scottsdale, AZ! 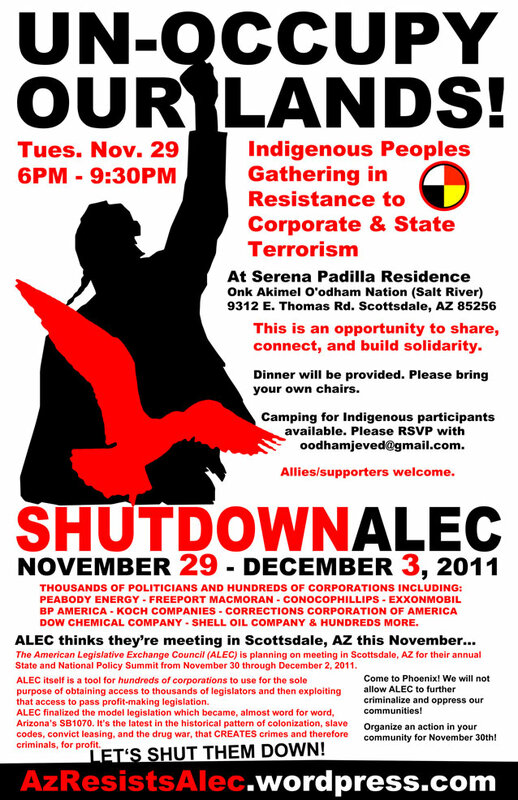 ARIZONA IS CALLING FOR A DIVERSITY OF TACTICS TO SHUT DOWN THE UPCOMING ALEC CONFERENCE IN SCOTTSDALE, AZ ON NOVEMBER 30TH. of control. We are for freedom of movement for all people. we’ve been resisting for over 500 years.